My name is Patty Braselton. I’m from McKinney, Texas. Back in 2001 I was diagnosed with breast cancer, and I had traditional radiation as part of my therapy. In 2017, I was again diagnosed with breast cancer in the same area. My oncologist PA had toured the Proton Center just two weeks prior to my getting ready to go in to radiation. And she could see this would be a better fit for me since I had already had traditional radiation. The staff at Texas Center for Proton Therapy was exceptional. I don’t know that I ever came in a day where I wasn’t welcomed with a smile or by name. The staff was always very positive. They were courteous. They were kind. They don’t call your name when it’s time for your treatment; they send a staff member to come and get you and to walk you back to the treatment room. They have all three treatment rooms named. Mine was Hope. And hope gives you that opportunity to get up in the morning and keep going. I saw Dr. Sturgeon once a week once I started my treatment. If I had any issues I had no problem picking up the phone and calling. And he was very much available during my procedures, you know, to check and make sure that everything was running according to plan. I think every morning that I get up and embrace life is to say “thank you for giving me this opportunity.” Forever I’ll be grateful. 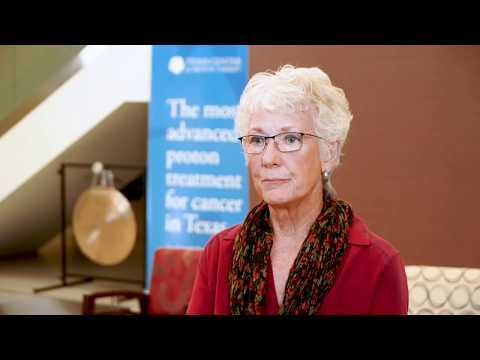 Breast cancer survivor Patty Braselton reflects on her diagnosis and treatment at Texas Center for Proton Therapy. The information included in this testimonial is based on one patient’s unique experience and is not intended to represent all patient outcomes or expectations.